Survival for breast cancer (BC) is lower in eastern than northern/central Europe, and in older than younger women. We analysed how comorbidities at diagnosis affected whether selected standard treatments (STs) were given, across Europe and over time, also assessing consequences for survival/relapse. 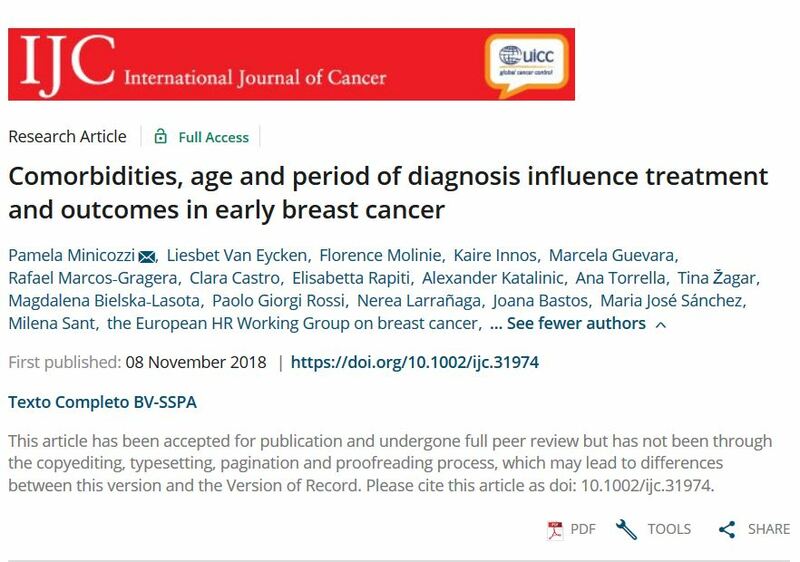 We analysed 7,581 stage I/IIA cases diagnosed in 9 European countries in 2009−13, and 4 STs: surgery; breast‐conserving surgery plus radiotherapy (BCS+RT); reconstruction after mastectomy; and prompt treatment (≤6 weeks after diagnosis). Covariate‐adjusted models estimated odds of receiving STs and risks of death/relapse, according to comorbidities. Pearson’s R assessed correlations between odds and risks. The z‐test assessed the significance of time‐trends. Most women received surgery: 72% BCS; 24% mastectomy. Mastectomied patients were older with more comorbidities than BCS patients (P<0.001). Women given breast reconstruction (25% of mastectomies) were younger with fewer comorbidities than those without reconstruction (P<0.001). Women treated promptly (45%) were younger than those treated later (P=0.001), and more often without comorbidities (P<0.001). Receiving surgery/BCS+RT correlated strongly (R=‐0.9), but prompt treatment weakly (R=‐0.01/‐0.02), with reduced death/relapse risks. The proportion receiving BCS+RT increased significantly (P<0.001) with time in most countries. This appears to be the first analysis of the influence of comorbidities on receiving STs, and of consequences for outcomes. Increase in BCS+RT with time is encouraging. Although women without comorbidities usually received STs, elderly patients often received non‐standard less prompt treatments, irrespective of comorbidities, with increased risk of mortality/relapse. All women, particularly the elderly, should receive ST wherever possible to maximize the benefits of modern evidence‐based treatments.